Twist and shout... with joy! The leading cause of fatal and non-fatal injuries in people over 65 is falling. In fact, 95% of hip injuries and traumatic brain injuries are caused by falling. It's a major problem that not only harms millions of people, but costs nearly $31 billion a year in the US alone. That's why a group of Italian researchers have created a wearable called Active Pelvis Orthosis (APO), which they hope could help improve elderly people's health by keeping them from falling. 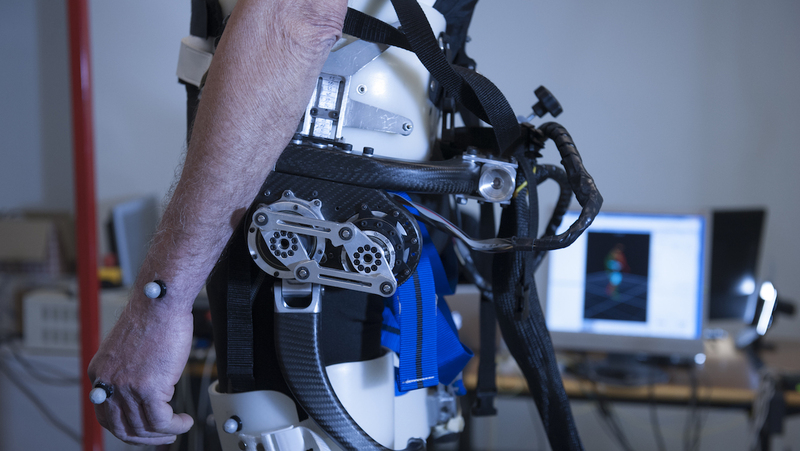 The device is basically a light exoskeleton - it actually kind of looks like a weird motion capture device - that wraps around your legs, hips and lower back. The APO can sense a fall within 350 milliseconds and then immediately applies torque to the wearer's body. It twists the hips in an effort to refocus the wearer's center of mass and keep them from falling. The device knows when something is wrong because it keeps track of the way you walk, learning and monitoring your stride and sway. When it sees that a motion is off, it quickly springs into action. Essentially, the wearable covers up for a humans' declining ability to avoid a fall. Right now, the APO is tethered to a computer. However, its learning capabilities are so strong that it can learn your walk after just a few steps. To test out its hip-twisting, fall-preventing abilities, researchers had people walk on a split-belt treadmill, in which the belts slowly move apart. When that happened, people would lose their balance, and the APO would kick in. While the APO has done well in its early days, there are still plenty of problems to overcome before it's ready for mass use. The device right now is a heavy, at about 9lbs. It also needs to work untethered and be less bulky so that it can better blend in with clothing. And finally, it needs to be able to deal with a wide range of falls, which could be anything from trying to sit down to walking up or down stairs.